The Team Hawkes-trained filly Estijaab is onto the Golden Slipper 2018 as the one to beat after her record-breaking win in the Group 2 $300,000 Reisling Stakes (1200m) on Randwick Guineas Day. Estijaab set a race record winning the Reisling Stakes 2018 on way to the Golden Slipper Stakes. Photo; Steve Hart. Hall of Famer John Hawkes enjoyed his third Golden Slipper success in 2014 and his first in partnership with his sons Michael and Wayne with the filly Mossfun (2014) who improved on a Reisling Stakes second. The Reisling Stakes runner-up She Will Reign also franked the form of the lead-up last Sydney Autumn Racing Carnival taking out the world’s richest race for two-year-olds next-up at Rosehill Gardens. This year’s Group 1 $3.5 million Golden Slipper Stakes (1200m) is now firmly on the agenda for progressive Snitzel filly Estijaab who is at $7 to win through Ladbrokes.com.au on March 24. The odds-on favourite in the Reisling Stakes after a close second to the current Golden Slipper favourite Sunlight in the Group 2 Silver Slipper Stakes (1100m) on February 24, Estijaab had to dig deep late to hold off her rivals. Ridden by Brenton Avdulla again, Estijaab scooted to the early lead from the Anthony & Edward Cummings-trained debutant Sister Sledge. Avdulla tried to steady the pace on the favourite up front with the top fancy out to go all-the-way. Estijaab led around the turn on the insider just in front of Uncle Mo filly Sister Sledge ($71), while the Peter & Paul Snowden-trained Pure Elation ($18) in her first Sydney assignment was also running home well on the fence. Looking vulnerable in the closing stages, Estijaab ($1.40) dug in and held off Pure Elation (2nd) and Sister Sledge (3rd) for the win in 1:09.17, which was nearly a full second faster than the previous race record set by English in 2015. “Very happy, she jumped out of the barriers and Brenton took control,” co-trainer Michael Hawkes said post-win. “She’s ran really good time so a very good win. “She did [look vulnerable] but the thing with this girl is you hit the go button and she really, really wants to win. While the bookies took her out from $4.80 to the $7 quote in all-in Golden Slipper odds, Hawkes remained convinced that there was improvement to come from today’s Reisling Stakes winner and that the two weeks until the big race was ideal. “She’s improved, you can see in her coat, she’s just the ultimate professional really,” he said. “She’s going the right way that’s for sure. “As long as she pulls up good, it’s two weeks then and that’s the way we’ve planned it. Avdulla, who will be chasing his first Golden Slipper Stakes winning ride, was also full of post-win praise for Estijaab. “I was happy with her, it’s been a funny day bit of wind around,” he said. “From the 700m she was actually floating, she waited for me to give her the go ahead. “Her last 100 was her best hundred. “She’s an absolute gem to ride and she’s obviously still learning her craft. “I have no doubt she’ll travel better with a bunny in front of her. “I’m sure she’s going to be a live chance [in the Golden Slipper] for sure. 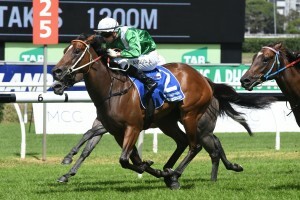 To back Estijaab in the Golden Slipper next race at the right price head to Ladbrokes.com.au today.